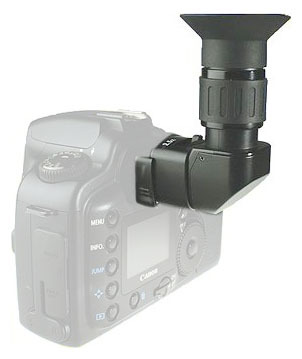 The Hoodman HRAV could be an interesting Canon Angle Finder C Alternative for you to consider. Why would you want an angle viewer? Great for an easier way to compose macro images where your camera is so low to the ground. Magnifier is a great focusing aid. You nose won't bang up against the back of the camera. Here is a video on the Hoodman. This is the angle viewer made by Canon pictured on the right. Is Hoodman a good choice as a substitute for the genuine Canon right angle viewer? It has been for me. Right angle finders are great to save the wear and tear on your neck when shooting at ground level. Occasionally when I am shooting a portrait from ground level to get an unusual perspective on my subject , I'll use the right angle viewer. Here is my disclaimer on this one. I've never used the Canon angle finder. 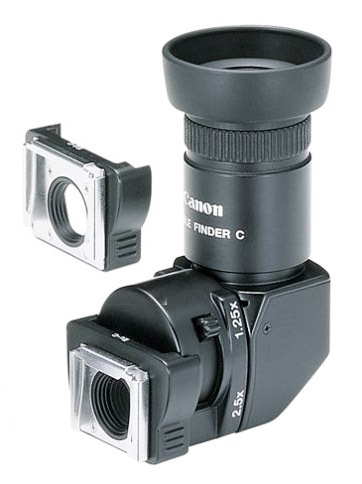 In general with most of the accessories, the Canon quality and price are higher. Sometimes the quality of a specific aspect of an accessory is not critically important and sometimes it's real important. If you've been on my web site before you know I am a big fan of reading reviews written by buyers of Canon and NON-canon cameras and accessories. I combine my own experiences with an extensive study of what users really like and don't like about the products they have purchased. Sometimes the comments are about relative issues on function and sometimes they are not. In this case I don't see enough of an advantage in getting the genuine Canon finder over the third party manufacturers. I've been using the Hoodman HRAV shown in the video above for about a decade and it has served me well. I got a case with it and it's great for holding the other adapters that are used for the different sized viewfinder that come on various DSLR cameras. I generally don't use case for the other adapters but have stored an extra Canon battery and memory card in there and have clipped the case to the outside of my camera case or onto my belt to keep it handy. How is the optical quality at magnified settings? How much light is lost when using the extra optics? What is the range of the diopter? Does it have a metal mount or plastic mount? How much does it cost? - that's the big one. Did I give you some consideration overload? Sometimes we do over-think things. I know that I do, and we get paralysis by over-analysis. Sometimes you just have to buy something for yourself and decide on your own. 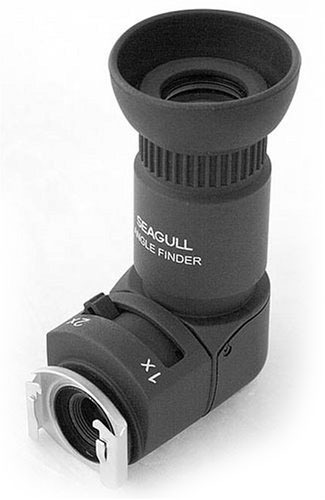 Another alternative to the Canon Angle Finder C is the right angle viewer made by Seagull. 5 adapters are included to fit Leica, Olympus, Fuji, Nikon and Canon. Magnifier is a 1 or 2x power. It has the 360 degree rotation like the others do. Diopter adjustment for varying eyesight of photographers. 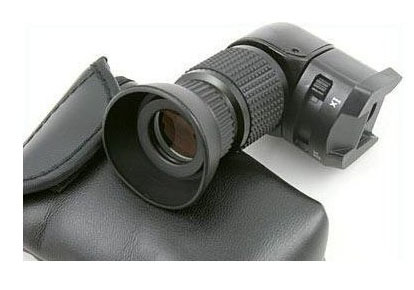 The eyepiece is a quality lens with 9 elements in 5 groupings. The Seagull right angle adapter is the most affordable alternative and gets good customer reviews. Using any one of these vendors will help me keep the web site going and it costs you nothing. The Seagull right angle viewer is the cheapest alternative to the Canon Angle Finder C.
Opteka right angle viewer and soft case.